If you suffer from insomnia, and it has nothing to do with the ghosts and ghouls running around this Halloween season, Bach Flower Remedies might just be the trick (or treat) for you. I know this is the second post this week with Bach Flower Remedies, but I'm reading a really great book and so inspired to use more of these great, natural remedies. I promise next week I will move on to other topics. 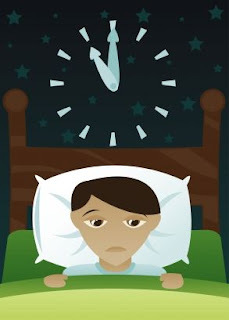 Insomnia usually stems from either organic toxicity issues or stress and worry. If you wake between the hours of 11 p.m. and 3 a.m., it's usually a toxicity issue and a good cleanse of the liver, gall bladder, lungs, intestines, or thyroid might be in order. If you wake between 3 a.m. and 5 a.m. it's usually a sign of stress and worry. Note: these are generalizations and only you know will be able to figure out what is causing your lack of sleep. If stress and worry are contributing to your lack of sleep, and let's be honest in these times who doesn't have plenty of stress and worry, here is a great list of Bach Flower Remedies to help you get some sleep. For those who may be unfamiliar, Bach Flower Remedies are tinctures made from the essence of 38 different flowers. They are safe, natural remedies. You can mix up to six of them for the most beneficial results. Look for these in your local natural health store. Happy Halloween to all of you! Have a very fun and safe weekend! Source: Advanced Bach Flower Therapy: A Scientific Approach to Diagnosis and Treatment; Gotz Blome, M.D. spraying lavender on my sheets has REALLY HELPED ME SLEEP! Hi MizFit! I don't think it's placebo. I love lavender essential oil on my sheets and the kid's sheets! It's 'dreamy'!